Dorothy and Russell Carney of St. Paris perform a celebratory cake-cutting at the Urbana Daily Citizen’s 35th annual Golden Anniversary Celebration on Sunday. The Carneys celebrated 60 years of marriage in April. 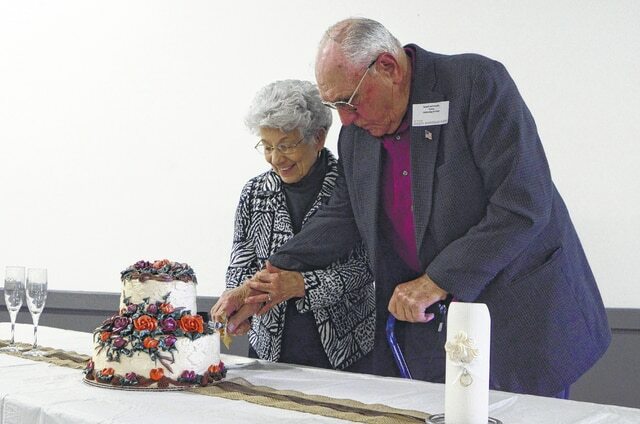 The newspaper hosts the event for local couples married at least 50 years. About 50 couples attended festivities Sunday at the county fairgrounds. Music, cake, ice cream and surprises were on the agenda. This year’s sponsors include Green Hills Community, Peoples Savings Bank, Walter and Stowe Funeral Home and Vancrest of Urbana. https://www.urbanacitizen.com/wp-content/uploads/sites/36/2015/10/web1_Cake.jpgDorothy and Russell Carney of St. Paris perform a celebratory cake-cutting at the Urbana Daily Citizen’s 35th annual Golden Anniversary Celebration on Sunday. The Carneys celebrated 60 years of marriage in April. The newspaper hosts the event for local couples married at least 50 years. About 50 couples attended festivities Sunday at the county fairgrounds. Music, cake, ice cream and surprises were on the agenda. This year’s sponsors include Green Hills Community, Peoples Savings Bank, Walter and Stowe Funeral Home and Vancrest of Urbana.